There are 5,609 items available. Please enter a number less than or equal to 5,609. Seller doesn’t provide any return label. No response. Bad company don’t shop with them probably a scam. Really good product. Was losing space on my phone so bought this 64 gig SD card that way I'd never have to worry about lack of storage on my phone, and it was simple just plug in the card and the new apps I download go straight to the sd card. I was expecting full speed transfer but nowhere near the listed speed in reading or writing big or small sequential files. However, it does a good job of keeping up HD videos so no issues there, its just transferring it afterward that takes a while. 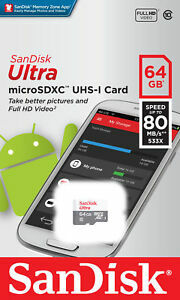 Great SD card for pictures and videos. The SD card captures high quality pictures and videos. I've used it with my Go Pro5 and it hasn't disappointed.